Tasty? Yes. Cruncy? Absolutely. 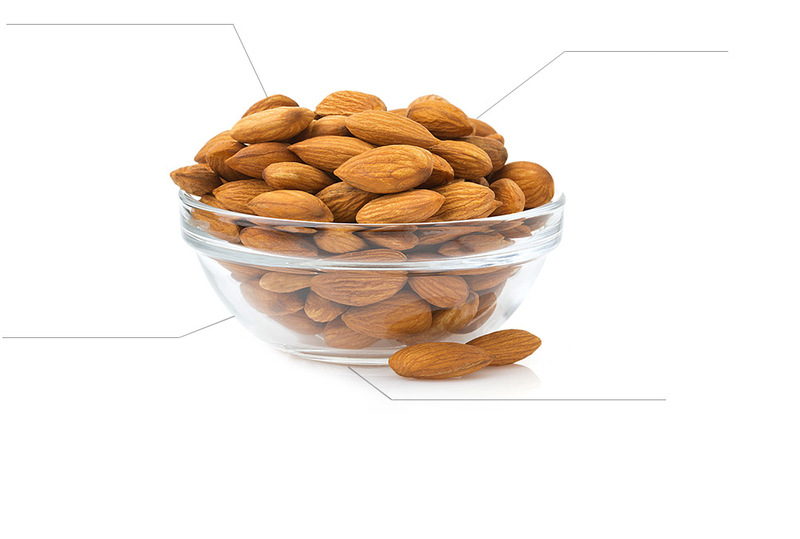 But did you know that almonds also pack a serious nutritional punch? From essential vitamins and minerals to 6g of protein, 3.8g of fibre and 9 grams of "good" monounsaturated fats per 30g serving, almonds go all out with stellar nutrition. Consumers everywhere are learning the importance of antioxidant (including vitamin E) and magnesium, and almonds are an excellent source of both. Almonds take good nutrition to heart, especially when you consider all of the nutrients found in almonds that contribute to healthy cholesterol levels. A good fit with many popular weight loss plans, almonds make a welcome addltion to products for consumers who are watching their waistlines. Scientific evidence suggests, but does not prove, that eating 1.5 ounces per day of most nuts, such as almonds, as part of a diet low in saturated fat and cholesterol may reduce the risk of heart disease. A one-ounce handful of almonds has 13g of unsaturated fat and only 1g of saturated fat.